This post contains graphic images. Let all readers beware. 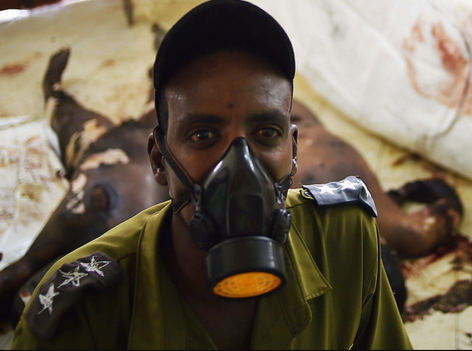 Note: In the initial posts about the Kenya Garissa attack errors were made. In the sake of accuracy those posts were taken down and have been replaced by information which is more thorough and precise in its substance. 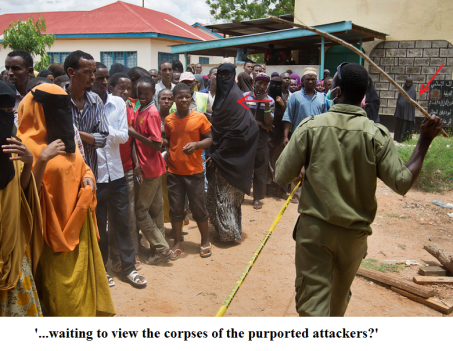 This information proves that the events at Garissa were not random but were, rather, based on a plot perpetrated by the Kenyan government itself, no surprise, since that same government committed great acts of corruption, RE: the 1998 controlled demolition US Embassy bombing and also the arch-fake Nairobi Mall Shooting Hoax. In contrast, this act is deemed a false flag, since it involves actual fatalities, whether staged or committed on-site as actual massacres. In other words, there are dead bodies, here. As a rule in hoaxes there are no corpses. 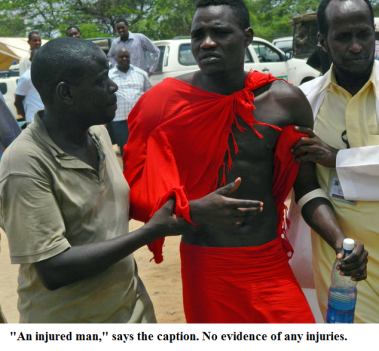 Even so, components of the Garissa attack are hoaxes such as the staging of grief. Regarding the events at Garissa University the powerful people who run the government of Kenya are spewing nothing but terminal lies. These lies are easy to prove. It demonstrates that Garissa is a plot against the people not a mere random act of terror by disgruntled so-called Islamists. 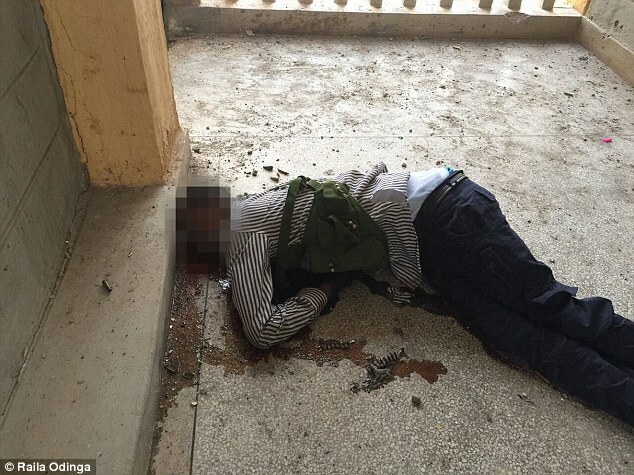 The slain terrorist is one of the four men who stormed the Garissa University College on Thursday morning and executed 148 people, mainly students before three of them were shot dead by police. The fourth one blew himself up. He blew himself up, really? Where is the evidence for that? Joseph Nkaissery, Kenya’s interior minister, confirmed that the gunmen had been strapped with explosives and blew up “like bombs” as they were shot by a special forces squad. All four died. NOTE: How did this man get blown up like a bomb to any degree? 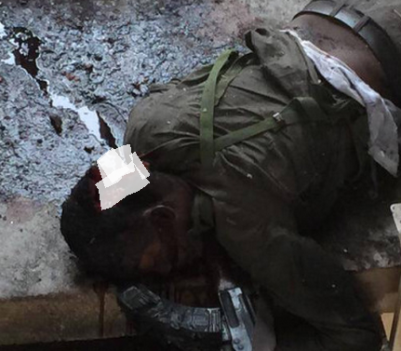 Even so, his ammo vest is still fully intact, other than what appears to be a bullet hole through it. Nkaissery is telling nothing other than bold-faced lies. The vests did not and were not detonated, period. Nor is there any evidence that those vests contained actual explosive charges. Yet, what does he do? He “confirms” it as if it is absolute truth. Lies, lies, lies, and more lies. That is all which can be said. Some bodies were so horribly wounded that relatives were not allowed to see them immediately and instead were given photographs of the slain students. 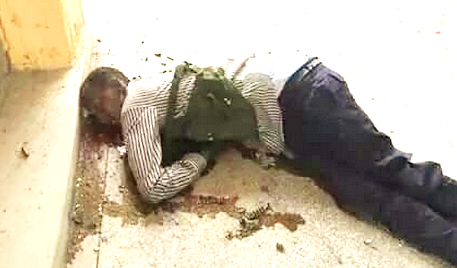 Students and security personnel were killed when a terrorist blew himself up with a grenade. A public display was made of their bodies? Why? The claim is in case someone could “identify” them. This is not believable in the least. Identification can be done at the morgue, not in such a macabre, wretched act. 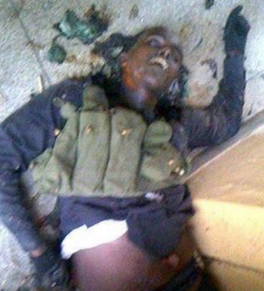 For certain, by the way, this man’s vest did not “explode.” Nor is his skin in any way charred. Notice the skin of the abdomen: no charring at all. Why take off all their clothes? How does that help in identification? 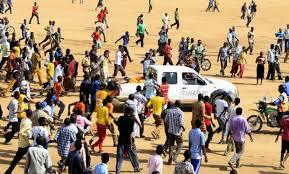 Are the men on the truck-bed even the same persons as seen here? Somewhere four men were stripped naked and roasted, either alive or dead. Regardless, through making a public display of their bodies, all that does is cause shock reactions, proving the psy-ops. It is unknown precisely how these men died. What is evident, though, is that a number of them have been shot in the head, some in the back of the head. How did that happen, unless they were assassinated? Without doubt, Kenya’s powerful Zionist-controlled elements did commit great acts of corruption. One of the greatest acts was the parading of naked corpses about before the public, and not just any corpses but those filled with stench, that is bloated carcasses. And not just this, bodies which were charred and which also may have had bullet wounds to the head. “Driving around on the streets in broad daylight in a country which upholds human dignity is embarrassing,” said Ahmed Yusuf, a student at another local college. They did more than drive them into the streets. They also drove back the common people, often by force, beating them with sticks. Who, then, are the terrorists, here? Oh, sure, they did all this for the regular people. In fact, those people requested such a public display. Who believes such nonsense? Notice the fact that the man on top’s skin has been roasted off his back, yet much of the rest of his body has no such injury. How cruel are those secret services that they would commit such a diabolical act. Regardless, who are these naked, charred people? Are they even the same ones seen shot to death on the balcony? The one head shot which can be seen clearly was isolated. Does this person bear any resemblance to the four known deceased? The man is seemingly bald, while the others have hair. With perhaps one exception it does not appear that he resembles any of them. 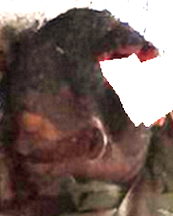 Note: images were lightened up to gain a sense of the distinguishing features. He surely doesn’t resemble the man who was killed from the rear, execution-style. Even so, the key issue is the fact that the corpses are charred. By no means are any of these men victims of charring or explosive injuries, other than what appears to be single gunshot wounds to the head. Then, there is this. How can these be reconciled? In fact, they cannot be reconciled. These corpses were likely artificially burned, once again to create the impression that these people really did were bomb vests, which become detonated. The man with three stars is the controller. 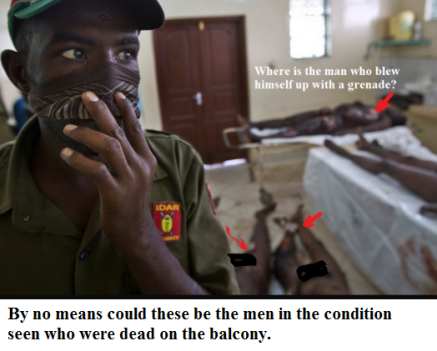 Notice that, in fact, these bodies have been badly burned. Was this done maliciously by the Kenyan special forces themselves in order to force the imagery to fit the arch-vile story lines? Arrows point to areas where the skin was roasted off; these are definitely killed people, the same ones which were paraded about in public. 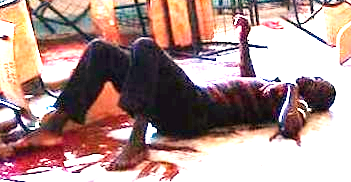 Are these torture victims, or was this done after their deaths? Or, are they deceased from another event? By the way, no one died at Westgate. Notice, though, the supercilious attitude taken by the Interior Ministry spokesmen about this wretched event. NOTE: It has yet to be confirmed that the deceased actually went about killing some 144 students. Curiously, few if any instructors or adults had reportedly died. It’s the same man in both images. Where are the AK-47 bullet wounds? The man is obviously an actor, nothing else. He made it all the way to Nairobi. Why is he not on a stretcher? It looks macabre enough. Yet, this person, a student, is acclaimed as dead. How can he be dead when he is holding up his hand and while his legs still have muscle tone? What in the world about this can be believed? It was all under such tight control. Even the journalists admit they don’t know what was going on, let alone the students themselves. 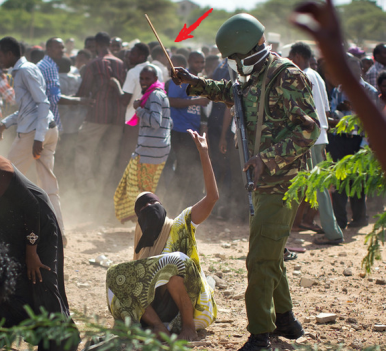 Garissa is a false flag combined with staging and falsification. 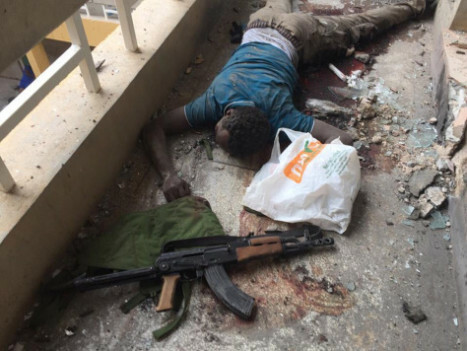 In contrast, it is not an act by a highly isolated/fringe terrorist group operating out of Somalia. The entire act was under the watch and control of arch-antagonistic, autocratic elements of the Kenyan government. It’s role in the scam is made abundantly clear by its lies and, in particular, the public display made with the bodies of naked, charred, deceased men. 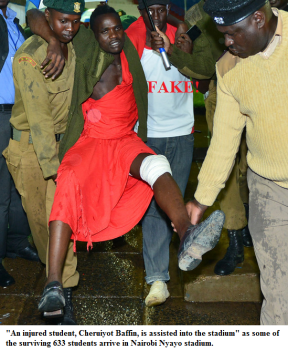 This treachery was committed as leverage to substantiate the Nairobi Mall attack lie, and that attack was exclusively committed by the Zionists. Thus, this act, too, is a Zionist operation. It is right out of the Israeli playbook. Fake a terror attack, and kill certain people, making them out as if they are the terrorists, while the real perpetrators who staged the criminal acts escape. Fantastic! False flags have been in Africa for a while. Staged, just like they do it in America!